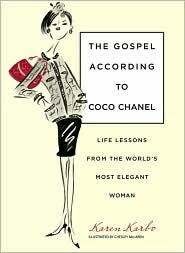 On this, the birthday of Gabrielle “Coco” Chanel (born August 19, 1883), I thought I’d review a fun book I read last month, The Gospel According to Coco Chanel, by Karen Karbo. It’s subtitled Life Lessons from the World’s Most Elegant Woman and it’s in that subtitle that I realized that this book is for everybody. Because if you haven’t read any biographies on Chanel, this is a great introduction to the highlights of her amazing life, and if you have read biographies on Chanel, this is a great break from all that reading, taking what you already know about Coco and thinking about how it applies to you in the here and now. With chapter names like “On Fearlessness,” “On Embracing the Moment,” and “On Money,” Karbo writes about Chanel’s life from beginning to end in an easy, accessible way that allows the reader to think of all the incredible things Coco was in her lifetime—an abandoned child, a struggling café singer, a fledgling designer, an icon, an aging woman in exile, the comeback of the fashion world—and to turn what Chanel experienced into a motivating self-help guide, or, at times, a cautionary tale, you decide. Threaded throughout is the author’s desire to own a Chanel jacket. Oh do I understand that particular lust, but unlike Karbo, who at first insisted that the jacket had to be vintage Chanel, as in, a jacket coming from Chanel when Mademoiselle was alive and designing, I would be thrilled with, as Karbo calls it, “Lagerfeld-Chanel,” meaning anything designed by Karl Lagerfeld since he took over as creative director of Chanel in 1983. I thought this was a great theme to work through the book, the wanting of, and the hunt for, a Chanel jacket, and I could’ve used a lot more of it, actually. I won’t spoil the outcome of Karbo’s search for you, but it certainly makes me want to write my own rakish book on getting my hands on some Chanel beyond what I can buy at the beauty counter. I tried this jacket on last November at Saks Fifth Avenue, which you can read about here. It was heavenly. It was also $4,200. This is a great end of summer read that can get you pumped up for a weighty biography of Coco you could hunker down with this fall, like Chanel: A Woman of Her Own by Axel Madsen or the one I hope to own soon, Chanel and Her World by Edmonde Charles-Roux, who was the editor of Vogue Paris from 1954 to 1966. Even without going on to read other more substantial biographies, The Gospel According to Coco Chanel is a standout book, giving a quirky, entertaining twist to a subject who still exerts so much influence in the sphere of fashion. Your book reviews are fast becoming my favorites--you read all the books I want to read! Like with the Birkin book, I've been eyeing this one. Unfortunately, I glanced through it with MP in tow, and he caught sight of a less than flattering line about men--and said to not bring it home. I need to sneak it in! Yes, yes to your questions this morning--J'aime mon carré is a NEW 70 cm. When I got home I did more research and there are a couple more colors I would love. This one ties fabulously and contains all the necessary colors to wear it with almost anything: royal blue, red, black, brown, gold, white . . . plus orange and pink. You know...I think you have just convinced me to go on a Chanel Read-a-thon!! I would like to tackle all of these...she just facinates me!! Thanks for sharing the review! I have seen a couple of films about her and her life.Amazing woman. About owning a Chanel, you never know... you might find it in a flea market for 1 dollar LOL. Have a grand weekend, my dear friend. I have written down the books on her I HAVENT read; thanks for the reviews and I love her too! I first fell in love with a Chanel skirt suit when I was thirteen and picked up a copy of vogue - one of those tweed ones with the pockets and gold buttons, I always secretly hoped I'd dress like that when I grew up - but $4200??? Gulp! Still got some growing up to do on the salary side to own one of those. Great review! If you're interested in vintage ones, they often come up at Kerry Taylor Auctions (associated with Sotheby's) in London. I spend way too much time looking through their on-line catalogues! Catherine my dear you are so bad! That new 70cm scarf you showed is killing me. I am going to look at it tomorrow. Lookin' ain't buyin', right? One good thing is that Linda at Wall St. said they don't have it in the hot pink, so that should save me. I'm also having a last look at the Ulysse notebook in other colors. I have to make sure Blue Mykonos is not better than Blue Jean Togo. Hi Pam, this book was such a different kind of read, I really enjoyed it. "Chanel and Her World" is next on my book wishlist--it has all these great pictures of what else was going on in the world when Chanel was designing, which I think is an amazing way to put her work into context. And after hearing Edmonde Charles-Roux talk about Yves Saint Laurent in the YSL documentary I just watched, she is my new fashion history heroine, she is SO knowledgeable and, I just learned, 91 years old! Hi Alexis, thanks for stopping by! I love what you are doing on your blog. Oh Sacramento, can you IMAGINE coming away from a flea market with a real Chanel for $1? No one would ever believe it was authentic. I need to start hitting up some high-end thrift shops. If I realize my Chanel jacket dreams they will be gently used items, I'm sure. Hi Paula, did you try those Chanel jackets on? $1,000, expensive, but still much more doable than $4,200, right? If I ever realize my Chanel jacket dream I know it will come from one of those high-end consignment shops. Hi Veshoevius, I always loved that ladylike dressing when I was young too. I still do, in fact I don't understand a lot of the craziness in fashion today, I still aim to get that Grace Kelly thing going on most of the time. That being said, I don't know if I need the skirt part of the Chanel suit. I used to want the whole thing but now I think I'd get a lot more use out of just one black Chanel jacket by itself. I'd wear it with jeans, dresses, trousers. But I'm with you $4,200 is just way too much to spend. Hi Marina, how are you? I keep seeing the 'PanAm' ad on TV and think of you! Now I want one of those bags too. I wish you were here so we could go to Saks Fifth Avenue and try on Chanel jackets. We'd have the best time! Hi Elizabeth, thanks for stopping by and thanks for joining my blog! You had me on yours when you wrote about 'Bois des Iles,' one of my favorite Chanel scents, and one I'd love to own someday (I hope they will sell it in a smaller bottle). I am SO with you on the Chanel jackets, I think they belong on grown-ups! When I had those jackets on I thought they made me look younger, actually, it was weird. I'm not usually knocked out by how I'm looking in the mirror but I have to say, with that black Chanel jacket on I was like, Hey, this is a good look for me! I think I know what you mean re the bags, especially the 2.55, it can be a staid and stuffy look, depending on how it's worn. Thank you for the heads up on the auction site for vintage Chanel jackets! Yay! I never heard of this place before but I am so going to look into them. I wonder how their prices are? So great to meet you and thanks for the tip! I've read the Charles-Roux bio and one by Justine Picardie. Are you serious that the jacket (only) was $4200? Without the skirt? Hi Terri, I just found out about the Justine Picardie Chanel book, now that's on my list too. And yeah, the jacket alone, without the skirt, was $4,200. Ouch ouch ouch.